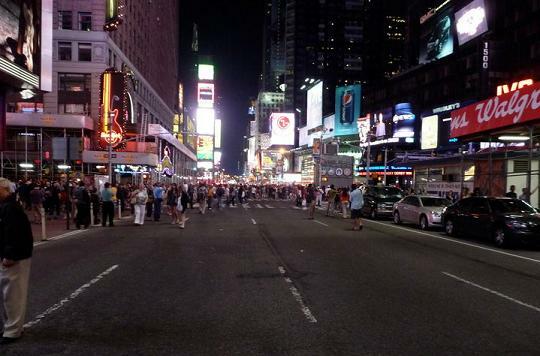 So, my teenage son was with my sister at Times Square getting ready to see the play God of Carnage during the fiasco of last week's car bomb attempt and evacuation. Luckily, I didn't hear or read a snippet of this breaking news and have to call to try to locate them to make sure they were safe. This is for two reasons. First, because my sister called me immediately to tell me that they are okay and out of harm's way before I panic hearing this on the surely-breaking news…because of course the enormous panoramic event she was experiencing: firemen, police, and public safety officials directing the multitudes to "Head North!," crowd rumors of a fire and a car bomb, and then, actual explosive sounds in Times Square, streets lined with news trucks and reporters—would be breaking news. Secondly, we didn't hear or read this on the news first because there was no breaking news! Was there a media/news micro-blackout? It would certainly seem so. If this is so, where is this story-in-itself? My sister called about 7:30pm, right as they were issuing the evacuation. Although I had a somewhat comforting, real –time, on-the-scene report from her, and knew she and my son were likely completely out of harm's way, she didn't know what was really going on. She asked me to try to find out, and call her back with any information. Of course, the mind can run wild. Dirty bombs, multiple attacks, etc. Although we were at Barnes & Noble and didn't have access to television, I had my PDA with wireless and internet access. I took it into the café and went to CNN, Yahoo News, and MSNBC, expecting to find at least a headline. Finding nothing, I (stupidly perhaps) even went to TMZ, knowing that if anyone was going to be pouncing on a huge, yet-unbroken story, which had a remote tie to celebrity with the Broadway connection, it might be them. Nope. That a possible terrorist attack in New York City, especially in one of the busiest and most media-saturated places on earth, wasn't being reported in real time didn't even cross my mind. But there was absolutely no information to be found. Perhaps the mobile versions of these mainstream sites have some kind of weird time-delayed format, I thought. It's naïve, but the truth is, I had never even used the internet on that PDA before, and I am no fan of irritating "mobile" versions/editions of sites, and I have never investigated their quirks and oddities. My husband decided to call his daughter, who lives in the City. Perhaps she would be able to turn on the television and relay some information. She did so, and said none of the national or local news was reporting anything about this whatsoever. Luckily, I still had the cell phone link to my sister, who was able to get bits and pieces of information from crowd conversations. She was astounded about my assertion that there was no real time news coverage. The streets were lined with news crews, and in her words, "I just can't express what a big deal this is." Alas, even after we returned home from the bookstore, it was hours before there was any coverage of this story, either on the internet or on television. Indeed, my sister and son were back at their hotel room searching for information as well, finding nothing, even on local stations. Even after the story finally broke all at once on the internet and television news, the time stamps on the Reuters and Associated Press stories were hours old. So, it would seem the stories were actually written as events were unfolding—breaking--hours before they were released publicly and able to be viewed. Who directed them to be held until so late? Is it the news outlets themselves in a fit of a weird reversal of one-upsmanship—in which no one wants to be the first to report something unsubstantiated? This kind of ridiculous timidity has been seen before. No one wants to be the reporter of something unfactual or premature. This was seen during the coverage of the death of Michael Jackson—the confirmation of his death was long and slow with the major networks. However, whatever happened to eyewitness reports? Do you have to have the inside scoop in order to report the bare bones of activity and what is happening from the scene? There were news crews present from the beginning—not to mention the New York Times building is in Times Square! Twitter did crash the night of the incident, apparently due to an onslaught of tweets from and about the scene. The one outlet that is buzzing, where information could be gleaned, is damned to nullity by these very dynamics. 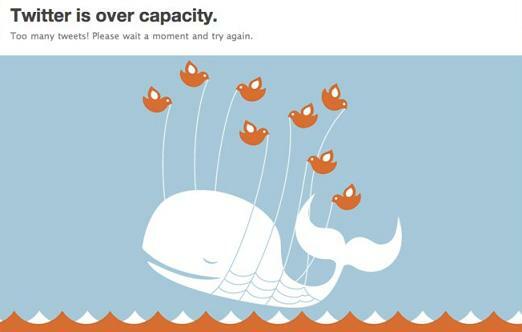 I don't use Twitter, so maybe many people are already familiar with the imagery, but it is interesting that the imagery used for the Twitter-is-overloaded screen consists of eight little birds hoisting a dreamy-looking whale from the ocean using a net and ropes. If that's too much of a stretch of an analysis, another interpretation is pointing to an event—that something big is happening to produce the overload: that the tweets are dealing with something large? It's a little ominous—this expectation that a big event will engage people to tweet, thus bringing the site down. It's really not that different than other things that have taken place in the past with communication—I remember even after isolated smaller events such as after tornados in Kansas, we would try to call family only to hear recordings explaining that all lines are busy. Of course things will happen to tie up communications, but there's something different about the expectation of the folks at Twitter—that it is known this is a primary source of real-time information to and from the masses, perhaps the primary source. The Twitter issue aside, and looking at the larger dynamics, is there some Homeland Security, political, corporate, or other imposition at hand? What does this type of instant and apparent complete control over the media ultimately mean? If there was some kind of media management because of the likely terrorism connection, it makes me wonder how differently a truly catastrophic and obvious terrorism event like that of 9-11 would be covered now, and if it's even possible to have that kind of as-it-happens, live and "uncensored" information. So, where are all the conspiracy theories? If anyone knows of any blogging, has their own story, or finds any other dialogue about this issue of delayed or censored reporting involving the Times Square Car Bomb Attempt incident, please contact me.